Mueller is now in the driving seat at VW but he must tackles issues such as a 'climate of fear' that may have been a factor in the emissions test-rigging. WOLFSBURG, Germany (Reuters) -- Volkswagen knows it will take much more than just new leadership and a corporate overhaul to clear the air after it was caught cheating in U.S. diesel emissions tests. Beyond the measures announced by the automaker on Friday, VW executives, customers, investors and workers alike are struggling to divine what lies ahead. New CEO Matthias Mueller, 62, faces a host of problems that had already been looming before the diesel scandal broke and may now be worsened by its repercussions. 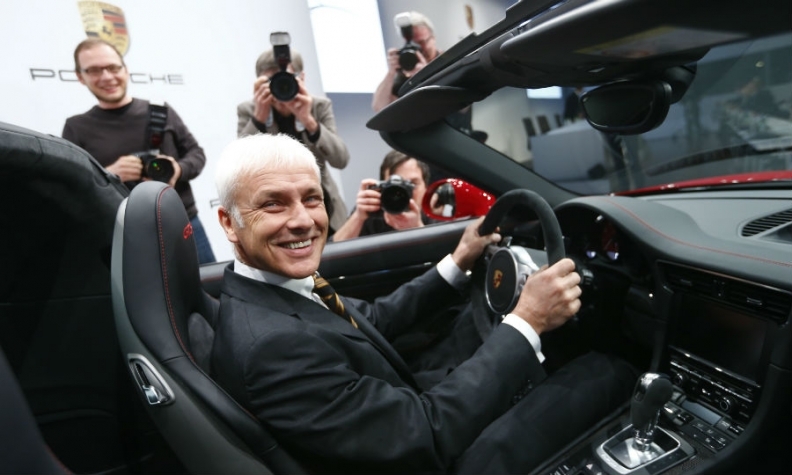 The 62-year-old VW Group veteran until now was in charge of the automaker's highly profitable Porsche sports car unit. Not least among these is falling profitability at the VW brand, but the immediate priority will be to clean up the mess in the United States, whose potential impact on the company has been compared to the 2010 BP oil spill. First may come a sustained show of contrition in a U.S. advertising campaign, said one VW manager, who asked not to be identified. "Humility will be the name of the game," he said. Following the crisis-management path taken by General Motors and News Corp., VW has tapped a U.S. law firm to lead a thorough investigation. It promises to be a long and rough ride. VW faces dozens of public and private lawsuits, government investigations, compensation and recall expenses, the combined cost of which could exceed the 6.5 billion euros ($7.28 billion) it has put aside. The company's market value has plunged by 23 billion euros ($23.75 billion), or 30 percent, in the week since U.S. authorities revealed that it had used a "defeat device" to mask illegal levels of nitrogen oxide pollution from diesel engines. Dealing with the fallout in the United States must override all other considerations, said a European fund manager who is among Volkswagen's 20 biggest shareholders. "Then we need to talk about strategic direction," the fund manager said, adding that VW could review its commitment to diesel because of a likely consumer and regulatory backlash. "This scandal has given them an opportunity to consider where they should go with their portfolio of models." Mueller should go further and abandon U.S. diesel vehicles altogether, said Bernstein analyst Max Warburton, recommending that the company funnel cash into plug-in hybrids and other low-emissions technology instead. "VW needs to think big and bold," he said. Another big challenge for Mueller will be navigating a sharp downturn in China, where VW's bumper earnings have until recently more than offset its underperformance in Europe. Many insiders are calling for a change of corporate culture. VW's centralization under Winterkorn and Ferdinand Piech -- ousted as chairman in April -- was ill-suited to a 12-brand empire with 119 plants in 31 countries. The "climate of fear" may have been a factor in the test-rigging, said one company official, just as it was two years earlier when Chinese customer complaints about defective gearboxes were suppressed for months. "We need to create an atmosphere in which problems can be communicated openly to superiors rather than concealed," labor chief Berndt Osterloh told staff on Thursday. The emissions trickery and its consequences are also spreading beyond North America. Germany's transport ministry said VW had also manipulated tests in Europe, with 2.8 million vehicles affected in Germany. Worst hit in reputational terms will be the VW brand itself, already struggling to find 5 billion euros in savings and lift profitability that has slumped below rivals such as Renault and PSA/Peugeot-Citroen. Under new boss Herbert Diess, the division had promised the first 1 billion euros in cuts this year, a goal reiterated three days before the diesel cheating emerged, in an investor presentation entitled "Stability in Volatile Times." VW's humiliation could weaken its European prices, further eroding the core brand's narrow margins and requiring still bigger cuts from unions. "The [U.S.] disclosures may impact negatively on VW's ability to maintain its global premium pricing power," Morgan Stanley analyst Harald Hendrikse said in a note this week. To limit the damage, dealers are already urging VW to improve its communication with baffled customers. Sales staff said they were "getting a lot of phone calls" from clients but silence from Wolfsburg headquarters. One dealer in Cologne said he was eager to recall some 2,000 vehicles for the illegal engine software to be neutralized, generating 1.5 million euros in servicing revenue as well as opportunities to repair customer relationships -- or even sell some more cars. "It's a tough market and we don't mind the extra business," he said, "as terrible as it is for the brand." But any silver linings look paper-thin to VW's 593,000 employees around the world -- almost half of whom are in Germany. A groundsman articulated their bemusement as he mowed the lawn in Wolfsburg on Friday morning. "I just don't understand why VW did this," he said.